When only the finest holiday decor will do! 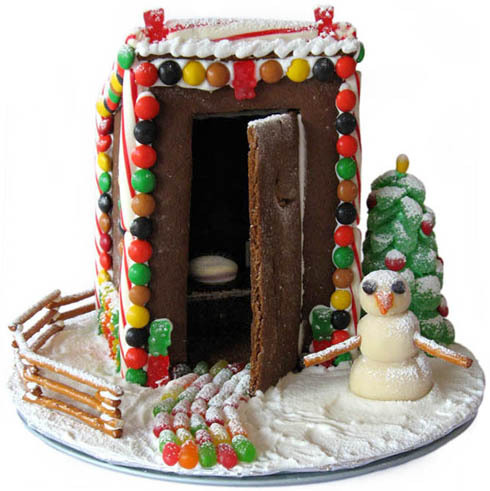 This 1/12th scale gingerbread structure is based on the 1939 U.S. Forest Service "One Hole Leaching Pit Privy" plan found in The Vanishing American Outhouse by Ronald S. Barlow. It lacks niceties such as a vent stack for noxious gases and a pit for soil. However, the fresh-baked gingerbread scent is an improvement over most outhouses. Toilet seat and path - Featuring a toilet seat made from peach-flavored gummy candy and toilet paper made from spearmint gum.